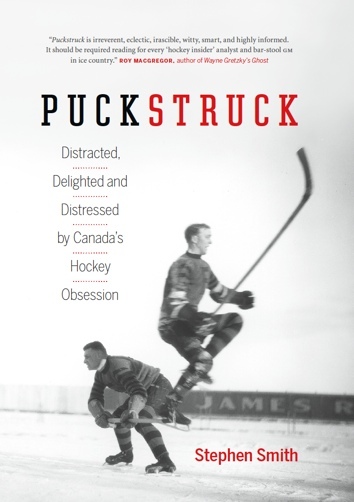 Today’s the day that Punch Imlach was born, on a Friday, in 1918, in a Toronto that was about to see the local professional team play for (and win) the Stanley Cup in the NHL’s first season. George was the name he was given that year; the nickname dates to the late 1930s, and seems (unfortunately) to have been concussion-based. Knocked out playing senior hockey for the Toronto Goodyears, Imlach is supposed to have revived and started swinging at teammates, who dubbed him “Punchy.” That was eventually trimmed as Imlach played on, never in the NHL, but notably with the QSHL Quebec Aces, with whom he would start his coaching career and oversee, in so doing, a young Jean Béliveau. 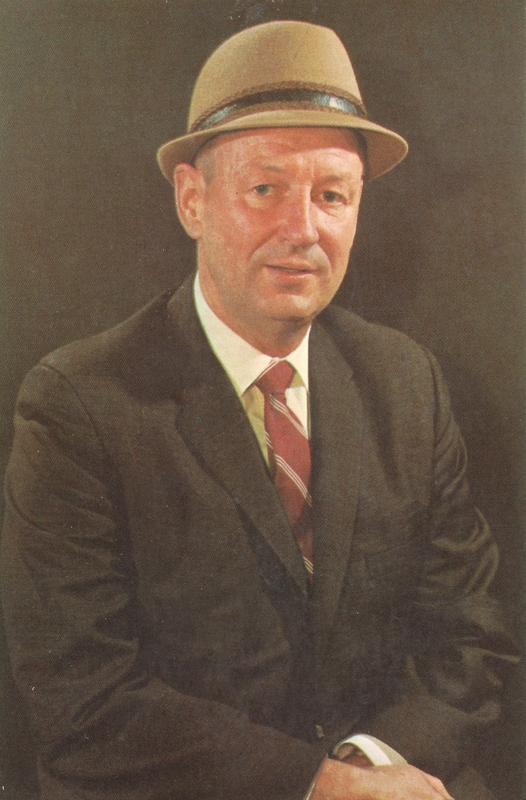 Imlach joined the Toronto Maple Leafs in 1958 as an assistant GM. In his first 11 seasons as Leaf coach, he steered the team to four Stanley Cups. Fired in 1969, he went to join the fledgling Buffalo Sabres as coach and GM. That’s the era from which this team-issued photo dates. “His dry acerbic wit is as much an Imlach characteristic,” the caption on the back explains, “as the intriguing hats he wears behind the players’ bench.” After a year-and-a-half’s tenure in Buffalo, he had another stint with the Leafs in the late 1970s, but it wasn’t pretty and — under Harold Ballard’s erratic stewardship — didn’t last. His 370 regular-season coaching wins remains a franchise record for the Leafs; he won 44 more in the playoffs, second in team history to Hap Day’s 49. Elected to the Hockey Hall of Fame as a builder in 1984, Punch Imlach died at the age of 69 in 1987. 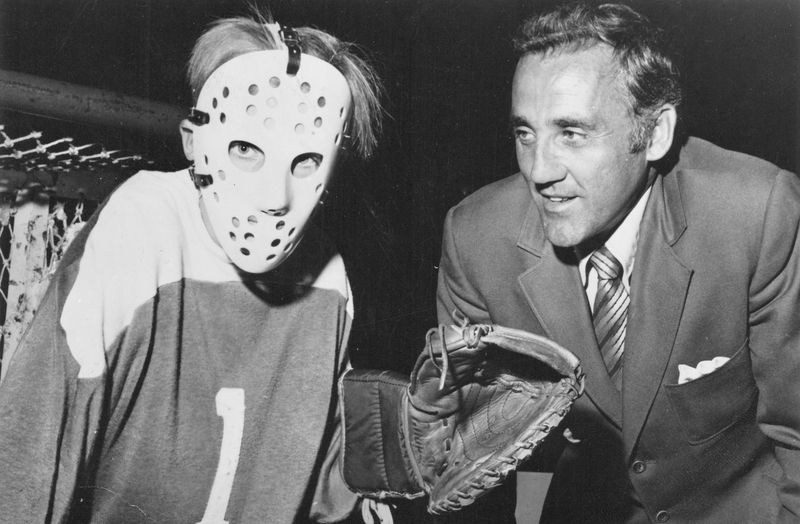 Face First: In 1970, 11 years after he first wore a mask in an NHL game, Jacques Plante poses with a young goaltending colleague to show off the junior version of his new Fibrosport mask. Fans in St. Louis sang “Happy Birthday” on this day in 1970 as Blues goaltender Jacques Plante celebrated his 41stwith a 20-stop 3-1 victory over the Los Angeles Kings. Playing in his 16thNHL season, Plante had been named earlier that same week to the roster of the Western team for the NHL’s upcoming 23rdannual All-Star game. While that was a match-up that his team would lose, 4-1, to the East, Plante’s performance was immaculate: in relief of Bernie Parent of the Philadelphia Flyers, he stopped 26 shots in the 30 minutes, allowing no goals. Plante would leave St. Louis that summer, signing for the Toronto Maple Leafs, but not before he’d steered the Blues to their third successive Stanley Cup finals. The man who’d introduced the goaltender’s mask to regular NHL duty in 1959 only played a part in the first of the four games the Boston Bruins used in 1970 to sweep to the championship: a shot of Fred Stanfield’s hit Plante square in the mask, which broke. He was down and out and — soon enough — on his way to hospital, leaving Ernie Wakely and Glenn Hall to finish the series in the St. Louis nets. Even so, Plante had a new mask in hand, one that he’d been developing with the help of — well, as The Windsor Star had it in 1969, “moon workers” from the U.S. National Aeronautics and Space Administration. Plante been involved in the mask-building business for as long as masks had been mitigating the impact of the pucks that were finding his face in the NHL. Mostly he’d worked with Bill Burchmore, the young Montreal sales manager from Fibreglas Canada who’d designed Plante’s original mask. Now Plante was launching a company of his own, Fibrosport, to develop and market face-protection for goaltenders of all sizes and skill-levels. That’s one of the junior models pictured above: they retailed for about C$12–$15 (about $75—$100 in 2018 money). Come the new season, the president of the company would be sporting the revolutionary professional model himself. One of those would set you back about C$22.50 ($150ish). At the league’s June meetings in Montreal, Plante was ready to do some selling. While previously he’d been talking about NASA scientists — “They are experimenting with some new, lightweight material that can be poured right over your face,” he said in ’69 — the word now was that this new model had been developed in cooperation with the engineering department at the University of Sherbrooke. It weighed just nine ounces, he said, and fit the face better than any previous model known to goaliekind. Most important, it was superstrong. The secret? Resin and woven fibres. That was as much as Plante was revealing in public, anyway. To prove the point (and sell the product), Plante arranged an exhibition of the new mask’s superiority. He’d brought along what the papers variously described as “a short-range cannon,” “an air-powered cannon,” and “a machine that fires pucks at 140 mph.” Set up in a conference room at a distance approximating Phil Esposito in the slot, it fired away at Plante’s newest (uninhabited) facade, which was firmly fixed to a stout backboard. The Futuramic Pro was what Plante was calling the mask that Leaf fans would get to know over the next few years. (He’d don it, too, for subsequent short stints with Boston and WHA Edmonton.) It didn’t disappoint in Montreal that June, withstanding the hotel bombardment no problem at all. Not so the pucks fired in the demo: in the press photos from that week, they appear misshapen and more than just a little ashamed. 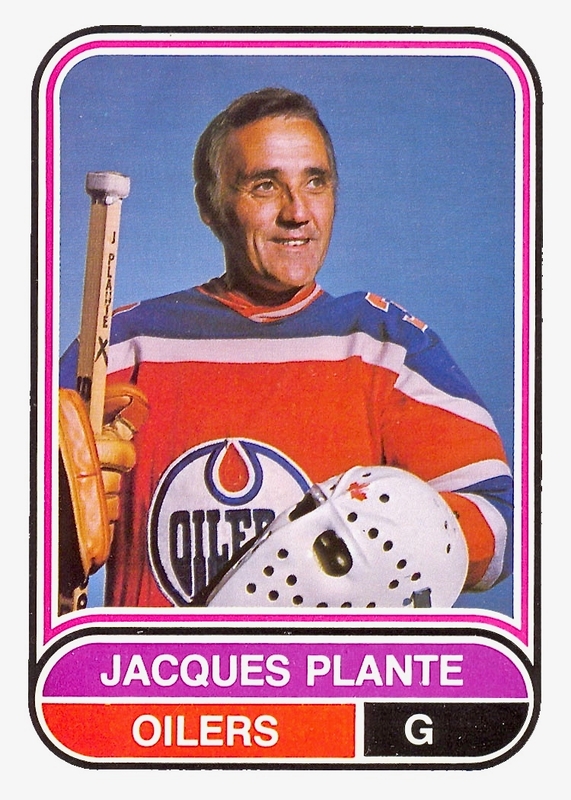 Man of the Futuramic: During his final stop in the pros (with the WHA’s 1975-76 Edmonton Oilers), Plante wore a version of the mask he’d introduced at the NHL’s summer meetings in 1970. Scored, Sat Upon: Toronto’s Babe Dye, c. 1920. 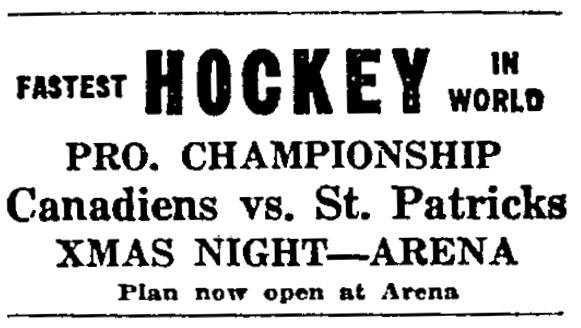 NHL teams last played a game on Christmas Day in 1971, when 12 of the league’s 14 teams took to the ice, but the very firsttime was on a Saturday 98 years ago when the Toronto St. Patricks hosted the Montreal Canadiens before a crowd of some 4,000 at Arena Gardens on Mutual Street. The season was still young, and both teams were looking for their first win, both having lost on the road when the NHL’s fourth season launched three days earlier. Toronto prevailed that Yuletide night, coming from behind to notch a 5-4 win. A few notes of the night? While each team had just two substitutes on the bench, the St. Patricks effectively had only one, with injured forward Rod Smylie getting into the game for no more than a minute. The word in the papers (including some in Montreal) was that the Canadiens line-up was in poor condition, having skated as a team just three times that winter — four, if you wanted to count the opening game they’d lost in Hamilton. Toronto’s Daily Star teased that Montreal’s “rolly-polly Canadien veterans” had arrived in Toronto accompanied by the rumour that they only had ten minutes of hockey in them, after which they’d fade out of the rink. But: “Rumour was a lying jade.” In fact, Montreal took the lead and held it for 37 minutes before the home team pulled in front, and even then the visitors never showed signs of quitting. Pitre scored again in the second, but Toronto wasn’t to be denied. Goals by Cully Wilson and Ken Randall tied the score at three before Mickey Roach put Toronto ahead to stay. Babe Dye scored what would stand as the winning goal in the third. Bert Corbeau got one back for Montreal, but while Canadiens pressed in the game’s latter minutes, they couldn’t score. Toronto goaltender Mike Mitchell “looked like a smart net guardian,” despite having stopped an early shot of Lalonde’s that “almost took an ear off.” His head “buzzed:” the Star reported that he would have been replaced, except that the St. Pats had no substitute goaltender to stand in his stead. 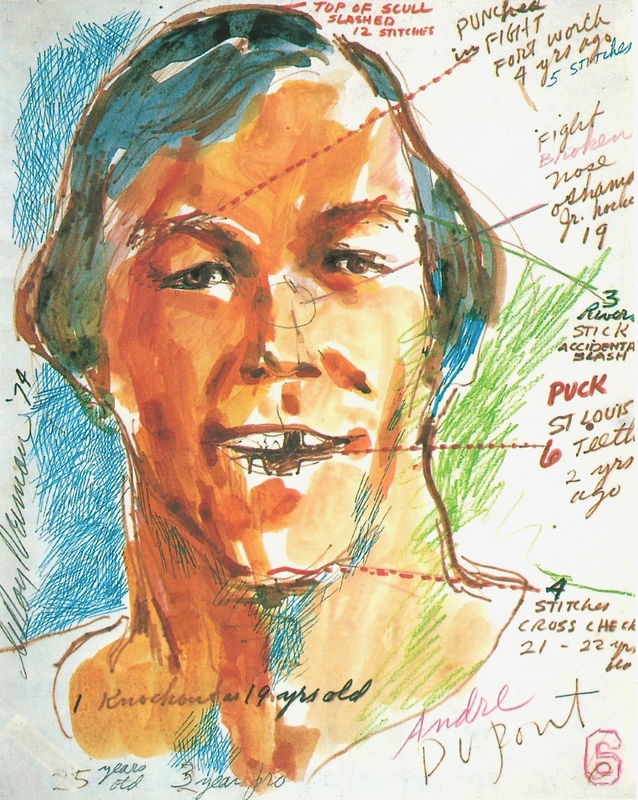 The Costs of Doing Business: Artist LeRoy Neiman’s 1974 portrait of pain shows some of the damage André “Moose” Dupont sustained playing defence. Drafted by the New York Rangers, Dupont made his name in Philadelphia, where as a feisty Flyer he helped win two Stanley Cups in the mid-1970s. He also served time with St. Louis and Quebec before retiring in 1983. Jack Darragh helped Ottawa’s original Senators win four Stanley Cups in his time (and theirs), and for those efforts (and others) he was duly inducted into the Hall of Hockey Fame in 1963. 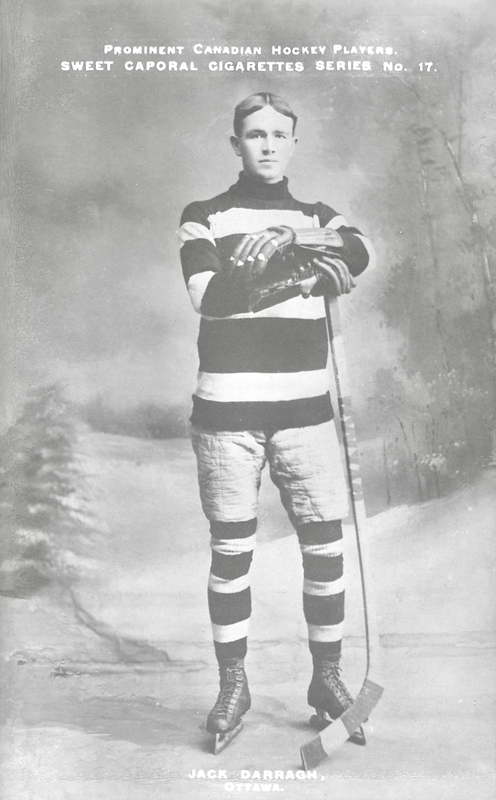 Ottawa-born on a Thursday of this date in 1890, Darragh was an industrious right winger who only ever played for teams in hometown, suiting up for the amateur Stewartons and Cliffsides before he signed with the National Hockey Association’s Senators in 1910. He was fast on his skates, they say, deft with pucks, insistent in his checking. He also has the shared distinction of having staged the NHL’s very first contract hold-out — on the very night the new league made its debut, no less. Hosting the Montreal Canadiens at their Laurier Avenue rink on December 19, 1917, the Senators skated into the first period with just a single substitute on the bench while Darragh and teammate Hamby Shore continued to haggle with management over the salaries they’d be paid. They’d resolved their differences in time for the second period, when both players made their debuts. Having built a 3-0 lead over the shorthanded home team, Canadiens went on to win the game 7-4. Darragh finished that first NHL season as one of Ottawa’s leading scorers, and he’d keep that up over the course of four ensuing seasons. Known for his penchant for scoring key goals, he notched the decisive pair in the 2-1 win that beat the Vancouver Millionaires in the fifth game of the finals and secured the 1921 Stanley Cup for Ottawa. That was supposed to be Darragh’s final professional game. His day-job was as an accountant with the Ottawa Dairy Company, and he kept doing that when he’d given up hockey. He kept hens, for a hobby, and I have it on good authority that I’m willing to cite here that “he had a wonderful pen of Rhode Island Reds.” When he went to the rink through the winter of 1921-22, it was to coach or referee. He changed his mind in the fall of 1922, unretiring and returning to NHL ice to play parts of two more seasons. He was dogged in his final year, 1923-24, by a broken right kneecap, and the word was that he planned to retire again. He died at the age of 33 in June of 1924 of peritonitis. Phrases portraying Darragh’s exploits on the ice sometimes intimated, in 1915, say, that “when Jack is right, there is not a player in the Association that has anything on him.” At other times, in 1920, he was described as the “handy all round man of the squad,” and also as “the ice cream expert” — referring, that last one, to that aforementioned ability for scoring timely goals that won games for his team. Jack Darragh was another tower of strength. Jack matched youth and stamina against the speed and strength of Pitre and had the better of the big Frenchman in every page of the one-side story. Darragh was badly battered, but whenever Pitre attempted his fancy work he found the boy with the bruised forehead and scarred face there to outskate and outbrain him. Darragh’s checking back was [sic] in a feature of the game. Pitre tried to put him away with a wicked blow in the third session, but Darragh jumped to his feet and was in the thick of it one minute after he had been stretched out cold behind his own nets. 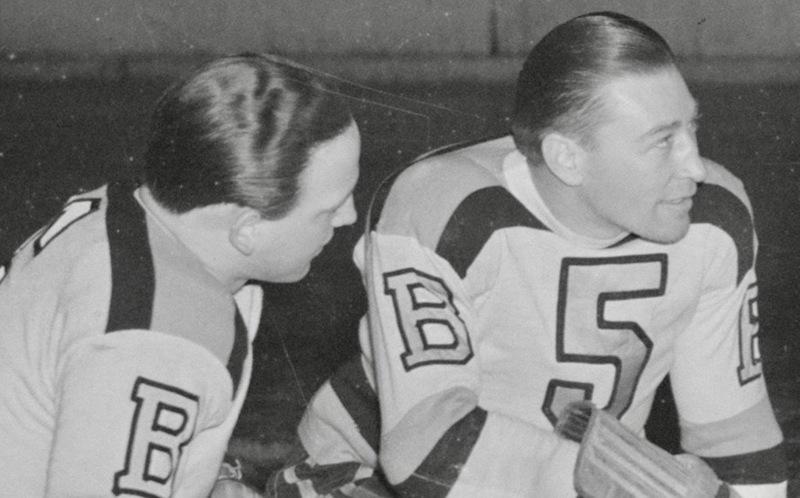 Hair Apparent: From left, these Bruins of the early 1940s line up as Jack Crawford, Dit Clapper, Flash Hollett, Des Smith, Jack Shewchuk, and Red Hamill. It is true that in most of the photographs you’ll find — the ones I’ve seen, anyway — Crawford has his helmet firmly in place. Also that — as in this one, from the Hockey Hall of Fame’s archive, or this one — from what you can discern of what’s beneath the headpiece, his hair looks decidedly scant. But then (also in the Hall), there’s this photo showing quite a coif. It’s the one you’ll see reproduced, as it happens in Andrew Podnieks’ voluminous historical ledger Players (2003). 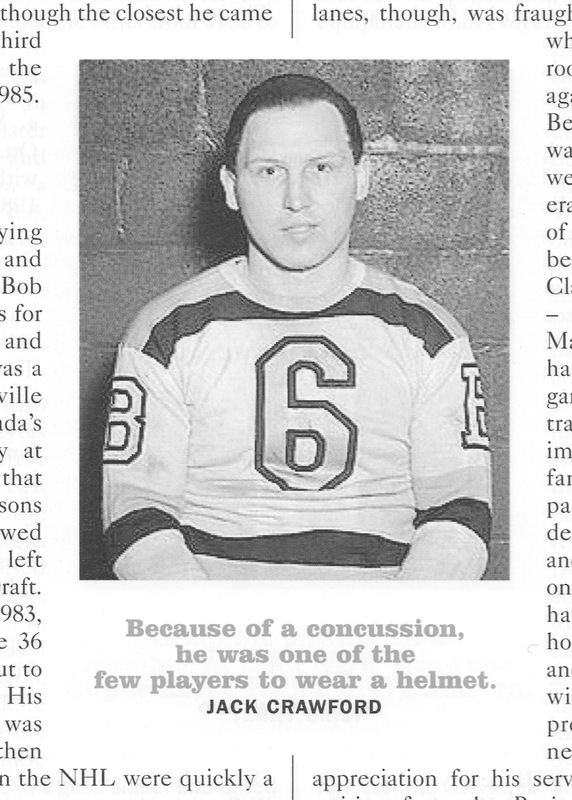 Podnieks, who’s typically very detailed in his biographical sketches, makes no mention in Crawford’s entry of any hair loss — the defenceman wore his helmet, he maintains, because he’d suffered a concussion early on in his career. Again, there’s no source provided for this. To yesterday’s question of whether Crawford was bald but then grew back his hair; acquired a toupée; and/or had his photograph touched up — well, I don’t really have any definitive answer on that. If only to further/muddle the mystery, I can offer up for examination the photograph that tops the post. There’s no date on it, but given the players lined up, it would have to have been taken between 1940 and 1942. That’s Crawford on the far left, wearing number 6 and what looks to be as healthy a head of hair as Dit Clapper’s impressive do alongside him. Clapper’s, we know, is authentic, and Crawford’s (can we agree?) looks genuine enough. Could it be artful? I can’t really decide. Zooming in, below, you can see that an editorial hand seems to have darkened the horizon of Clapper’s hairline to distinguish it from the background. In Crawford’s case, I go back and forth. If someone did go to the trouble of painting it in — well, then, all I can say is bravo. Slow Train Going: Ready to board the train for Hibbing, Minnesota, members of the 1940-41 Black Hawks doff their hats at Chicago’s North Western Station. 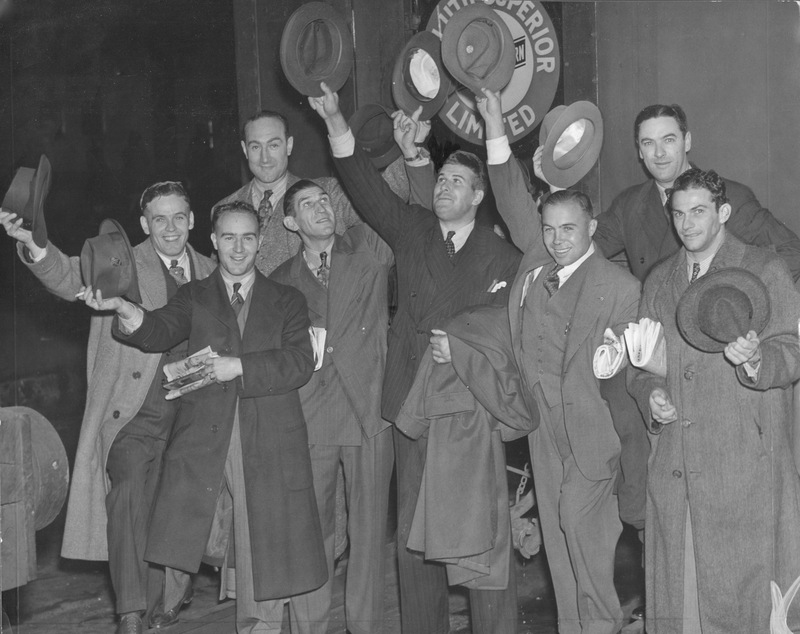 From left, they are: Bill Thoms, Pep Kelly, Earl Seibert, Johnny Gottselig, Jack Portland, Mush March, coach Paul Thompson, and trainer Eddie Froelich. The Chicago Black Hawks went to Hibbing, Minnesota, for training camp in October of 1940, which is what they did in those years, having prepped for years, pre-seasonally, in Champaign, Illinois. Later, 1943, the Hawks would shift briefly to Minneapolis before giving up on Minnesota altogether in the fall ’45, when they took their training to Regina, in Saskatchewan. In ’40, second-year coach Paul Thompson was young, 33; two seasons earlier, he’d been manning the left wing for the Black Hawks, as he’d been doing since 1931. In ’38, coached by Bill Stewart, Chicago had won a surprising Stanley Cup. 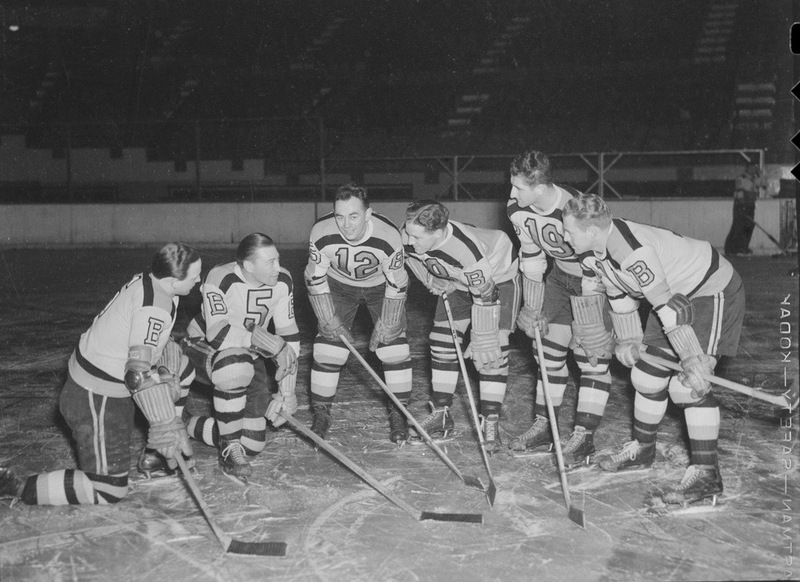 Aiming to repeat that feat, Thompson’s team convened in Minnesota three weeks ahead of their opening game of their 48-game regular-season schedule, a November 7 meeting with the New York Americans slated for Chicago Stadium. Twenty-five players travelled to Hibbing. Those who didn’t accompany the coach on the train from Chicago came south from Winnipeg. Paul Goodman was the incumbent in goal, though the Hawks were excited by a young local prospect, too, Sam LoPresti. Defensive veterans Earl Seibert, Jack Portland, and Art Wiebe would be challenged by another Minnesotan, Eveleth’s own John Mariucci, and a recently graduated mining engineer from the University of Alberta, Dave MacKay. Returning forwards included Mush March, Johnny Gottselig, Phil Hergesheimer, and Doug Bentley. The latter’s brother, Max, was given a good chance of making the team, as was a young Winnipegger by the name of Bill Mosienko. Thompson was enthusiastic: to his mind, this team was shaping up to be “the most evenly balanced in Chicago history.” The team’s tempestuous owner was on the page when he blew in for a visit midway through camp. Never before, Major Frederic McLaughlin declared, had a team of his looked so good so early. This despite the fact that the Hawks hardly skated the first week of the pre-season. The ice was iffy in Hibbing that October — what there was of it. This despite the fact that the Hawks hardly skated the first week of the pre-season. The ice was iffy in Hibbing that October — what there was of it. The crew at Memorial Arena was no doubt doing its best to get a freeze on for the hockey players, but they had their troubles that first week. Five days into camp the Hawks still hadn’t seen a serviceable surface. Thompson curtailed Wednesday’s drills before they really got going: “five minutes of skating,” the Canadian Press reported, had worn the ice down to the floor.” The players took to the outdoors, where they kept themselves busy with a little road work, a little golf. Wednesday saw Mush March score a hole-in-one on the Hibbing course’s 190-yard seventh hole. He’d been prepping all summer long, you could say: March had spent the summer as a club pro in Valparaiso, Indiana. By Thursday, the coach’s patience was almost at its end: if the Hibbing rink couldn’t get it together by Friday, he’d take his team and head west for 500 miles, to Sault Ste. Marie, Michigan, where former Chicago defenceman Taffy Abel managed the rink. Friday, with the team packed and ready to go, Hibbing’s ice-makers came through, and the Hawks skated for the first time with sticks and pucks. “The frozen surface stood up under two 90-minute tests,” the CP noted; “jubilation was rampant.” Art Wiebe was the season’s first casualty, suffering a gash over the right eye along with what the CP termed “a slight brain concussion.” No worries, said coach Thompson: he’d be back in action next day. The second week of camp, the ice was fine. Monday 1,000 spectators showed up to watch Chicago’s first open scrimmage. Coach Thompson played referee, “allowing some fouls to pass unnoticed, but … quick to stop play on offsides.” It was 19 minutes before anyone could score, with Johnny Gottselig beating Paul Goodman. As planned, the Hawks decamped the following Monday for St. Paul. They had another week of drills ahead of them there, along with a series of exhibition games against the local American Hockey Association Saints. Those were played, eventually: when the Black Hawks first arrived in St. Paul that vexed pre-season, they learned that the refrigeration plant had broken down, and that the ice wouldn’t be ready to receive them for another day or two.